It's that time of year where I get on a plane and head north to be with family. There are many reasons I enjoy this time of year but one of my favorite parts is how I allow myself to have a lot of couch time and read a book. 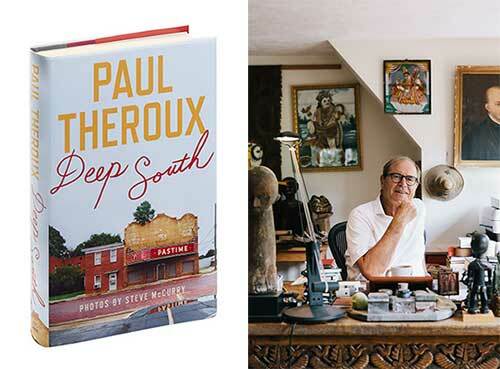 This Christmas, I'm all about Deep South, the latest by my favorite author, Paul Theroux. It's a non fictional account of his time spent in the South- from South Carolina to Alabama, Mississippi and Arkansas, as he visits the same small towns throughout four seasons. As I look forward to delving into Paul's latest travels, I asked my friend Nan Myers of Thomasville, Georgia what her favorite books have been this year. If you ever had the pleasure of visiting her lovely shop, Firefly, you already know she always has a stellar book selection. Here are her favorites of 2015... Thank you Nan, they're all so good! Eat by Nigel Slater; Habitat by Lauren Liess; Once in a Lifetime by Gestalten Books; Do Unto Animals by Tracey Stewart; The Shopkeepers by Gestalten Books; Winter Cocktails by Maria del Mar Sacasa; The Monocle Guide to Better Living, Good Business, Cosy Homes; Animal Kingdom by Millie Marotta; A Christmas Memory by Truman Capote; The Night Before Christmas by Roger Duvoisin; Plumdog by Emma Chichester Clark; Holly Hobbie's The Night Before Christmas by Clement Moore.